Our new CPP Narrow leaf spring upgrade kits are available for 1967-81 Camaros and 1962-74 Novas. 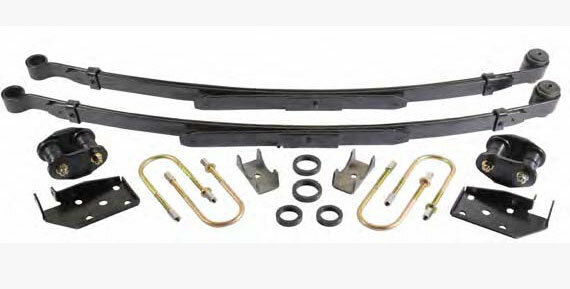 These kits allow for the absolute largest wheel and tire to be used without relocating the leaf springs front and rear hangers inboard. No cutting and welding on the frame rails. Kits include a custom narrowed axle bracket to match the narrowed leaf perfectly. These kits will gain you 1/2 additional tire clearance per side. Kits will fit original rear ends or any aftermarket 3 tube style 10/12 bolt or 9 ford. Great upgrade for any street, strip or Pro-Touring performer. Kits work with traditional 3 axle tubes commonly found with 8 and 9 Ford rear ends. Assembled with teflon buttons for a smooth quiet ride. Kits yield a 2 drop. 6573RLS-D 1964-73 Mustang, multi-leaf, pr.